Recipe of the Day: Perfectly Poached Chicken Breasts - Eat. Fit. Fuel. This was my first time poaching chicken breasts. Super simple and when you’re done you have perfect chicken and chicken stock! That’s what I call a 2fer! The chicken can be used for anything from salads, or shredded for tacos. I can’t believe I’ve never made chicken this way before! Place the chicken and aromatics in a pot: Arrange the chicken in a single layer on the bottom of the pot. It’s fine if they overlap a little, but they cook more evenly if they are in a single layer. Scatter the salt and aromatics over top. Bring the water to a boil: Place the pot of chicken on the stovetop over medium-high heat. Bring the water to a boil. You’ll see some white scummy foam collecting on the surface as the water comes to a boil — if you’ll be using the poaching liquid for a soup or other recipe, you can skim this off; otherwise, it’s fine to leave it. Reduce to a simmer, cover, and cook: As soon as the water comes to a boil, reduce the heat to low, cover the pot, and let the chicken simmer. Begin checking the chicken after 8 minutes: it is done when opaque through the middle and an instant-read thermometer in the thickest part of the meat registers 165°F. Chicken will typically finish cooking in 10 to 14 minutes depending on the thickness of the meat and whether it is has a bone. 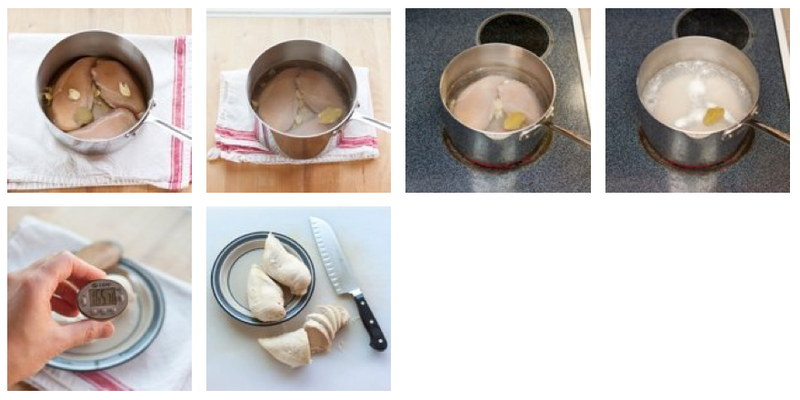 Serve or store the chicken: Poached chicken can be served hot, room temperature, or cool. It can also be served whole, or it can be sliced or shredded as per your recipe. If you cooked your chicken with the bones, you can pull or cut away the bones, return them to the pot with the poaching liquid, and simmer until the liquid is reduced. Once strained, this is a quick chicken broth that can be used for soups or rice. Protein. How Much Do You Need?